Do you experience IBS, constipation, food sensitivities, stress, anxiety, insomnia, or joint inflammation from arthritis? 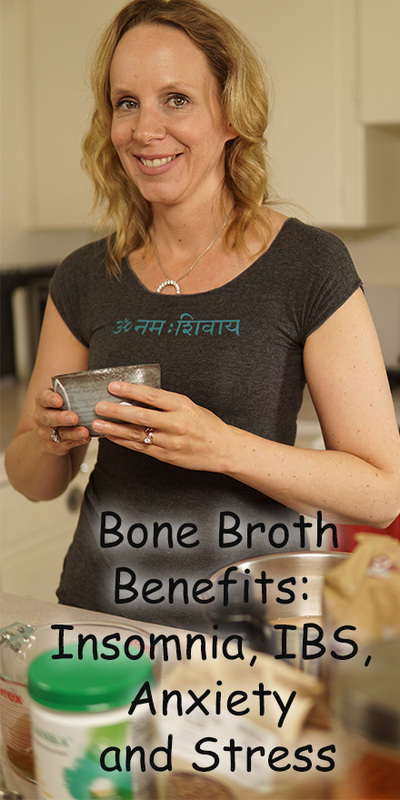 If so, this video on the benefits of bone broth is for you. A lot of us can relate to experiencing stress and anxiety. We go through periods when we take on too much work, we do not get the nutrition our body needs, we over-exercise, and sometimes we do not get enough sleep. All of this puts our body under a tremendous amount of stress. What you may also know is that when your body is under stress your nervous system gets negatively impacted which has a negative impact on your joints, immunity, sleep patterns and digestive tract. However there is more to it and it has to do with bone broth. Glycine is an amino acid found in bone broth that plays an important role in collagen synthesis. In fact, it is an essential amino-acid that is required in larger quantities during times of stress. When your body is under stress you need more glycine. If you suffer from food sensitivities or IBS then you will want to know that glycine plays an important role in “sealing” the mucosal walls of your digestive tract. In fact, for all of those suffering with digestive issues such as gas, bloating, constipation, loose stools, irritable bowel syndrome (IBS), and inflammatory bowel disease (IBD) and food sensitivities, the collagen, amino acids and anti-inflammatory nutrients in bone broth help to seal your gut and maintain its protective barrier. (mucosal lining). 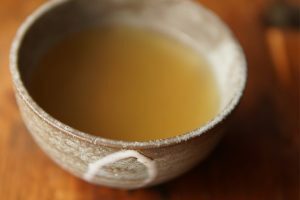 Consuming a cup of bone broth a day can help reverse chronic digestive complaints. If you suffer from inflammation in your joints from rheumatoid arthritis you may benefit from the collagen found in bone broth. Arthritis is the result of cartilage breakdown in your body from lack of collagen. Collagen acts as a sponge between your bones and makes up the fluid in your cartilages of your joints. Bone broth provides your joints with GAG’s: glycosaminoglycans including chondroitin, hyaluronic acid and glucosamine. These readily absorbable sources of GAGs in collagen provide lubrication and moisture in your joints, rebuild and slow down the breakdown of cartilage and provide tensile strength in your ligaments. Type 2 collagen is what we naturally store in our connective tissue and it plays an important role in our joint and cartilage health. It supports the inflammatory response in your body and is beneficial for those who suffer from rheumatoid arthritis. Vegetarian Sources of Glycine: soybeans, spinach, kale, cauliflower, cabbage, pumpkin, banana, kiwi fruit, cucumber and beans. Take the whatever meat bones you have leftover and place them in a soup pot or slow cooker. Immerse them in water and add a dash or so of apple cider vinegar to leach out the mineral content of the bones. I also add a bay leaf, and whatever vegetables I have on hand. Usually an onion, carrots and celery. Let me know would bone broth most benefit you? IBS, constipation, food sensitivities, stress, anxiety, insomnia, or joint inflammation from arthritis? If you would like 7 days of yoga for better sleep then go to melissawest.com/sleep and Sign up for 7 days to better sleep with yoga and I will send you 1 video a day for 7 days with the best of yoga, ayurveda, self massage and pranayama (or breath practices) to help you get the best night’s sleep. Thanks for pressing that like button and subscribing for more videos like this every Tuesday. Next post: Types of Yoga | Difference Between Yin Yoga and Restorative Yoga | Which is Right for You?